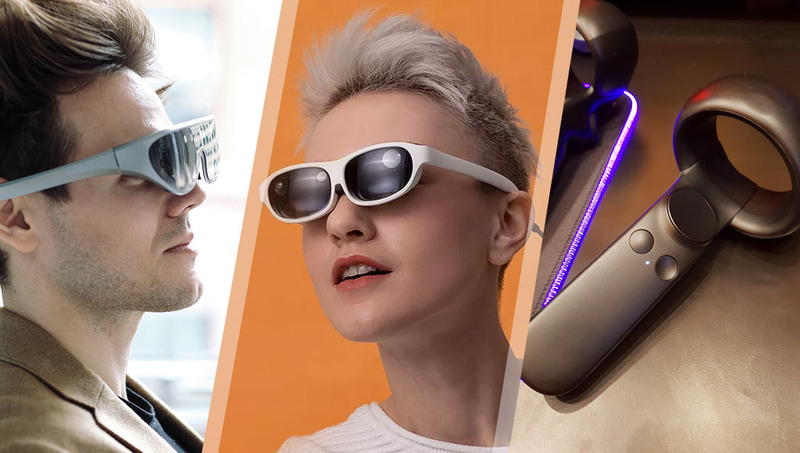 This week, CES 2019 wrapped up with more tech news including Rokid’s Project Aurora AR glasses, Nreal’s AR glasses (both nice and slim! ), an emerging trend for the inside-out tracking controller shape, AR company ups and downs… and a whole lot more! Nominate your emerging tech inspirations of 2018! Extended for one more week! Nominate and show your appreciation for someone who has helped you in your emerging tech journey! Dev Diner has a yearly tradition where we ask for nominations for those in emerging tech who’ve inspired you in the year gone by. Help give a bit of recognition to those who really deserve it for their efforts in 2018. We like to highlight those in the industry based on the community’s nominations, rather than any judgement calls of our own. Show your appreciation by heading here and nominating a person or two! Want me on your team this year? I’m available! I’m on the lookout for a new full time gig as a creative technologist! I can help your company even if you’re not in Sydney (I can remote work!). Looking for a role in VR/AR (WebVR/AR is especially exciting! ), conversational apps and/or other emerging tech. I want to do things that haven’t been done before with a great team. Feel free to reply to this email if you’ve got something in mind! Rec Room has been installed on over 1 million VR headsets so far — that’s a pretty solid number! They’re super elaborate and bring a level of VR we can’t do yet at home. With higher and higher resolutions on the way, finding ways to only render what people are looking at in full resolution (foveated rendering) is a necessity. Qualcomm’s new VR headset looks pretty similar to the HTC Vive Cosmos headset from last week’s newsletter, so it could also reveal more about the Cosmos. Tony gives the lowdown on all you need to know about the Vive Cosmos after CES 2019. Inside-out tracking controllers for Windows Mixed Reality, the Vive Cosmos and Oculus Quest are all kinda similar. Yuqing Guo, 2018 EPSON Panoaward VR/360 silver winner, reveals his how he takes high quality 360 photos with the Kandao QooCam. A new virtual lab will use VR to build 3D models of tumor samples, providing a new way to look at cancer. TPCast Air for Enterprise will enable wireless streaming from desktops to multiple standalone headsets such as the Oculus Go. Public Homes on the Rift allows users to open up their private virtual spaces online and they can stream the experience to Facebook Live. “The Pimax 5K & 8K headsets feature an ultrawide 200-degree field-of-view, focul service displays, wireless transmission”. The Nreal glasses show a whole lot of potential in a pretty compact form factor! It sounded like Meta was done for this week, but there are signs of a potential bouncing back too… all in one week! They’ve got a bunch of pressure from a pending lawsuit though. The founders of Layar, which was sold to Blippar in 2014, are one of the bidders for Blippar’s assets now that Blippar are selling off their assets. One of the big early pioneers in AR tech, Osterhout Design Group (ODG), is reportedly going out of business too. The headset announced last year is now ready and “actually contains some compelling differentiators: It’s lightweight, tetherless, and offers a very wide-angle video display by augmented reality headset standards”. “A 27-inch transparent LCD on the door of this concept oven can show you what rack to use, zoom in on your food and show you next steps”. It’s a smart mirror for salons, hotels and homes. MixCast Moments are designed to help gamers easily create mixed camera MR videos to share socially and will initially be rolled out to VR arcades. These headsets connect via USB to a user’s phone to deliver AR, so it can do things like Fortnite. It’s quite neat to see some gyms and studios getting into emerging tech. Samsung Galaxy Sport smartwatch to accompany the Galaxy S10? There’s a leak of what could be the next Samsung Galaxy Sport. It’s now waterproof, has better battery life but is a bit bulky. The iPod co-creator’s watch is pretty darn expensive! VentureBeat has a list of top products for each ecosystem from this year’s CES 2019. Virtual storytellers is a really interesting concept — Tellables’ platform is powered by Amazon Sumerian. “AiFi’s new NanoStore is a tiny storefront packed with sensors that enable a cashierless experience akin to Amazon Go”. Quick, remember this in case we need something to give evil robot overlords so they do that sci-fi thing where we stump them and they shutdown. The KettlebellConnect can dynamically alter its weight and resistance by rotating inner cores, ranging from 12lbs to 42lbs within the same device. It’s a shopping cart with a built-in barcode scanner and credit card swiper that can soon automatically scan items dropped in using three image recognition cameras and a weight sensor. A lot of Google’s assistant was around at CES — they’re definitely a solid competitor to Alexa. That solid competitor thing… it’s got a lot to do with the fact Google’s Assistant is on a whole lot of phones. It’s like a targeted ad delivered straight to your house. “A new program at the research agency is aimed at creating a machine learning system that can sift through the innumerable events and pieces of media generated every day and identify any threads of connection or narrative in them”. The new Hexbot looks pretty darn cool — it can help you draw, write, laser engrave and 3D print! There was outcry about employees of Ring being able to see your doorbell feeds – Ring say that it isn’t true. Here’s a way to program Adafruit’s Circuit Playground Express using an Android smartphone or tablet while on the go. A nice overview of a few of the common attack vectors and how to stay safe. This Uno-compatible shield gives a 16-character, two-line LCD in the middle with a stereo jack that can transmit speech to powered external speakers. It’s compatible with the Teensy 3.2 and similar boards. Temboo made a list of every IoT event and conference in 2019! All About Circuits have a look at the IoT stuff from CES. This could protect a bunch of cyclists from breathing in fumes. Events and Conference Discount Codes! At JOLT Roadshows, inspirational speakers from the world’s leading enterprises will share how they have embraced AI to improve revenue, customer retention, and experience! They’re at six locations throughout early 2019 in both USA and Canada. Click the link for info — it’s free!